The basic for an efficient pivot usage is the consequent use of the table. 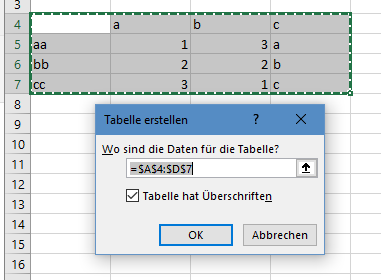 Define the table and convert it to a table. If you specifiy already the table capture ensure the checkbox is tagged. If not Excel will create automated column captures for you. If you use a lot of tables, it might be good to define a clear table name. It will help later. Next step is, to define the pivot. 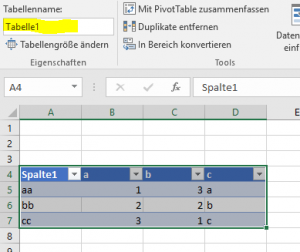 As we will use a table a source, the pivot automaticlly select the data based on the table boundaries. 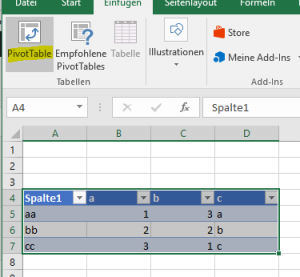 The pivot will everytime reflect the current table strucutre when it will be updated. As in the example below, I add a new column “d” and update the pivot afterwards. The pivot will now reflect the last table change. 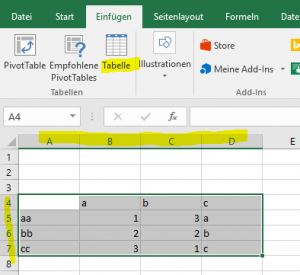 For me one of the most important features of Excel it the combination of tables and pivots. Not to use this combination will make a lot of manual work when changing tables and afterwards updating the pivots.